Score This: Photog 1, Cheapskate 0 - Yep, it's groozi! We are a 5 person construction company and need to update our website and brochure with NEW images of our staff. We would like to give an opportunity to the right photographer to take our company images. Ideally we need a formal and an informal picture, also a landscape shot of our company vehicle. Basically these pictures will help us get off the ground and renovate our website. If you do a good enough job on our company portraits then you will ideally be awarded a future PAID contract to take pictures of our job sites (once we get a job!). We will want to have the rights to be able to use the photos on our website and brochure/print media. You will get a boost to your portfolio! Experience in corporate photography along with a portfolio is a MUST or your email will be disregarded. We are looking at scheduling the shoot within the next week so be prepared to move fast! We are a 5 person photography company and need to update our photography studio and shooting space with NEW office spaces for our staff. We would like to give an opportunity to the right construction crew to build our new company digs. Ideally we need a formal and an informal working space, also a landscape crew for our out side shooting area. Basically these structures will help us get off the ground and renovate our old space. If you do a good enough job on our company building then you will ideally be awarded a future PAID contract to build structures of our photography clients (once we get a job!). We will want to have the rights to be able to exploit you as we see fit just for credit and a great job! You will get a boost to your structure building skills! Experience in corporate building along with a portfolio is a MUST or your email will be disregarded, after all beggars can be choosers. We are looking at scheduling the construction within the next week so be prepared to move fast! I don’t know who the authors are, if they care to be identified, I’ll add proper attribution if they contact me. What do you think? Very funny, smart, and witty. Another kind of, not really related example is a sales person that is your friend trying to sell you on the same thing you already have but cost more, like insurance, but says I am your friend can you help me out so I can make a living!!! Why do you think I am trying to save money fool, so I can make a living!!! Or can you refer me to 10 people? Wait so now I am working for you for free and you are guilting me into look for referrals because I didn't buy from you!? Some times it is hard to settle for an honest living, when that dream seems so real. EX: Thinking that doing the photography for free will pay more dividends later than taking a job for horrible pay. This happens to writers as well. "What? Why do you expect me to pay you for something I could do on my own? How about if I let you do it for free and THEN if I need it again, I MIGHT consider paying you." If you didn't need someone to craft your writing for you, you wouldn't be looking for it for free. It takes time to write and proofread, and I value my work highly. Sad thing is, these kind of ads exist because some photographers go for it, thinking it will pay eventually... But more than often, after the first unpaid contract, nothing more will come! Too many aspiring photographers, too little job opportunity. I find the second ad very funny!!!! Well answered and hope those construction guys saw it!!!! Yet another incredibly insightful entry. If you could please update us about this story, that would be wonderful. That's pure genius! I'm a graphic designer as well as a photographer and I can't tell you how many "jobs" I've had to say no to, because I don't work for free. I usually say, "no thanks, my portfolio is fine without you". Brilliant! I'm a graphic designer, and I've had a similar experience on numerous occasions. Absolute genius! It's sad when people think photography is a trade that doesn't have as much value because "all you need is a camera." So I'll work for free with the possibility of being paid for other work in the future... um, no thank you, I'll just stick to the work I get paid for. How clever! I'd love to find out who the authors are. Blake, That is brilliant. I loved it. Thanks for sharing, I wish we could post this somewhere where all future idiots could see, just how ridiculous their requests sound. I'm just not so sure they would get it though, B/C they obviously just "don't" get it! Thanks for the laugh! I saw that as well, great visualization! What a clever response. Touché! These tassers obviously thought someone would be stupid enough to fall for this sort of scam otherwise they would not have chanced it. It's a good warning to everyone to watch out for these clowns. What galls me is that they state quite openly that the applicants must have a lot of experience or will be ignored. Someone at that level in their career would not even bother to read the ad! ROFLMAO! I absolutely love it, and will steal the idea the next time someone asks me to write something "for the exposure". Classic. I was recently approached by a national broadcaster in Australia who wanted an image of mine for the website. When I quoted a reasonable fee, I was advised "we don't have a budget for photography". My response was that they apparently had a budget for the web developer, the producer and her salary, so why were photographers expected to donate their work? Of course, I received no response. Sheila Sydney, Australia .-= Sheila Smart´s last blog ..Converting images to black and white or monochrome =-. as they say on the Mastercard ads - PRICELESS There are some people out there who have the gift of the witty and cutting reply, these authors are amongst them. As for the original construction crew, there's also a name for them 'Money grabbing Bar-stewards' don't even think of asking THEM for a discount. Very clever answer indeed. Sadly, photography is more of a non-tangible concept for some people and that's why the word is treated as such. And there will always be a photographer-wannabe to do this kind of job for free. You might appreciate this ad for "Free wedding photography": http://dundee.gumtree.com/dundee/93/52198193.html. So fantastic. 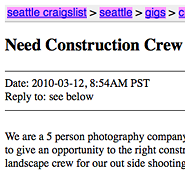 Sad thing is that I imagine more photographers applied than builders. Haha! Absolutely brilliant! Need to remember this for some replies! Haha that's brilliant. Great ad posted by the photographer!! POsted to friendfeed, that will feed twitter and facebook - spot on - there should be more people that respond like this. Awesome. I just posted this to my facebook fan page. Cheers Blake! Hopefully, this light-hearted but spot-on-response to what's really being asked of photographers by other supposedly creative (but oblivious) clients, will make its way virally into some other creative forums. Thanks, Blake, for both finding it posting. May it spread widely and quickly. I'm posting a link on my blog back to this post today!